This is the fifth feature in the Hops Among Friends series. 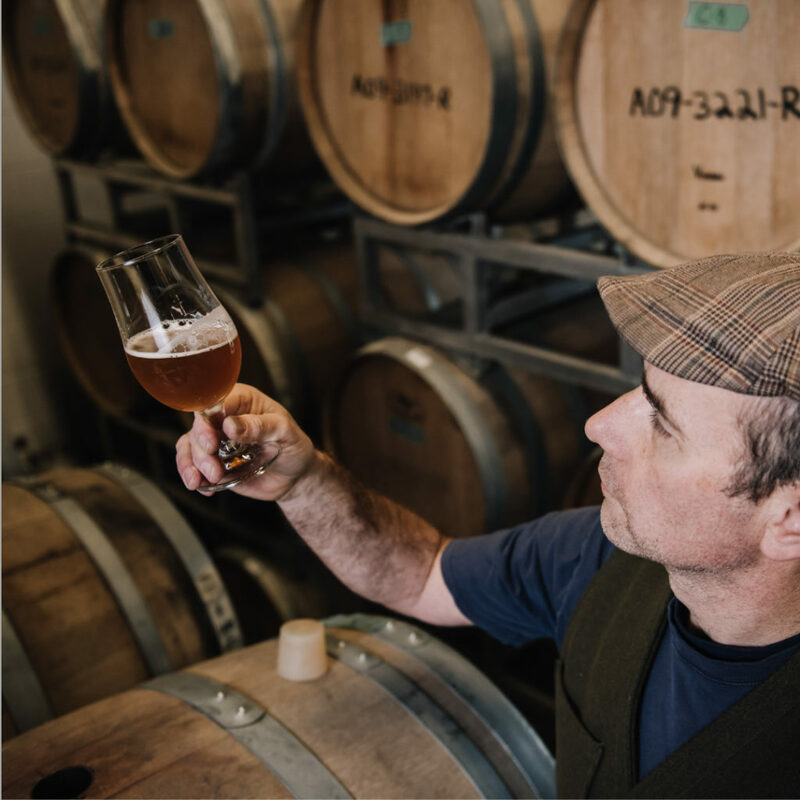 This series is designed to introduce you to the people that make up the craft beer scene on the BC Ale Trail. 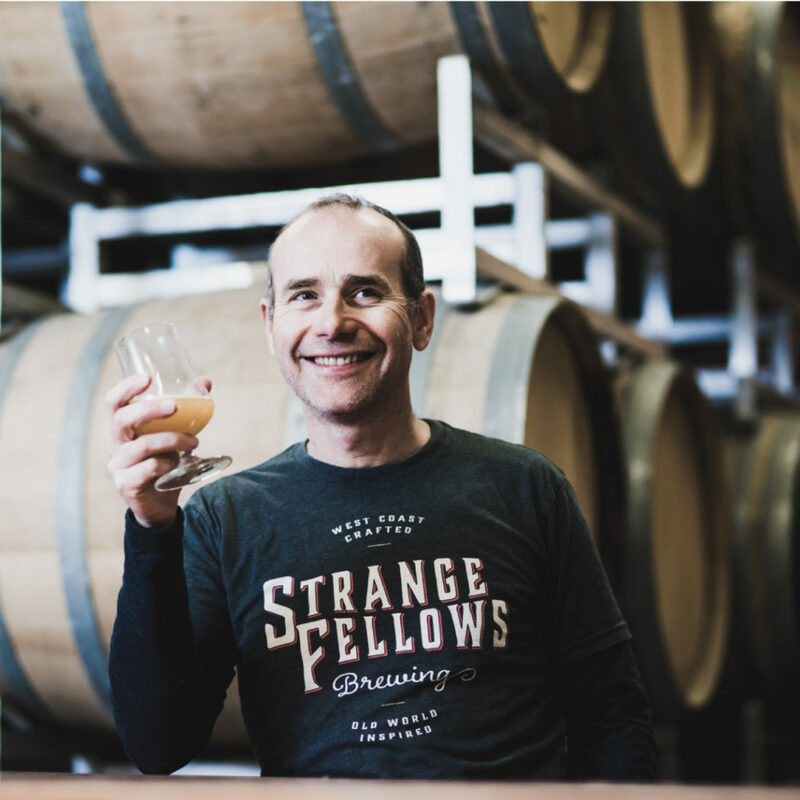 My last Hops Among Friends interview was with David Varga from 33 Acres Brewing and he recommended I speak with Iain Hill from Strange Fellows Brewing. 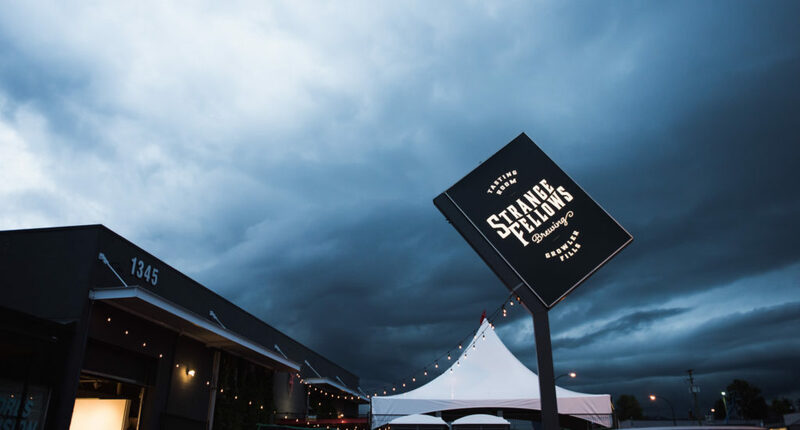 Opened in late 2014, Strange Fellows is located in East Vancouver and is on the Vancouver Ale Trail. I hadn’t had the opportunity to connect with Iain before this interview, so I was thrilled to have the chance to learn more about his really interesting craft beer background. In setting up this interview, I noticed that Iain describes himself as a “Particularist” in his email signature line, so I was very intrigued to speak with him. It was a particularly interesting discussion. KL: Iain, you’ve had a long career in the craft beer industry, starting with making home-brews with your dad, and working with two craft beer legends, John Mitchell and Frank Appleton. What is your most memorable moment to-date in your 25-year craft beer career? IH: There is not a specific moment in time I can visualize. However, the most memorable, significant and emotionally frightening moments were embarking on my own business. I’ve got a wife and three kids, and a house. It was one of the hardest things I’ve done. It was such a risk. Making the mental leap of choosing to take a huge risk and having the stomach for this. The other thing that really stands out for me is pursuing my degree in BioChemistry. That was something that was very tough for me personally, as I’m not a natural academic. For a full look at Iain’s brewing history, visit a recent article in What’s Brewing Magazine, What’s Bruin: The Career of Iain Hill. KL: Tell me what you learned from taking this risk? IH: I learned to have more confidence in myself. I learned to trust myself more. I realized that I can do this. There is lots of luck involved, but I’ve also learned to trust myself. KL: You are known for your wealth of expertise in the craft beer industry and your willingness to help out so many breweries. What is your philosophy here? IH: We are lucky, there are a lot of nice people in this industry. It’s a friendly industry amongst smaller craft breweries. It’s easy to help people and I know that when I need help, I know I’ll probably be able to get help back from others. There is a lot of give and take in this industry. Maybe other industries don’t support each other in this way. KL: Why do you think the craft brewing industry is so collaborative? IH: Maybe because so many that go into this business are not coming from such a hard-core business background. Most breweries started because their brewmasters and owners just liked beer. They aren’t your typical modern business person. Most of the people that work in this industry are very friendly. I sure hope this continues as the industry grows and the industry standardizes businesses practices. 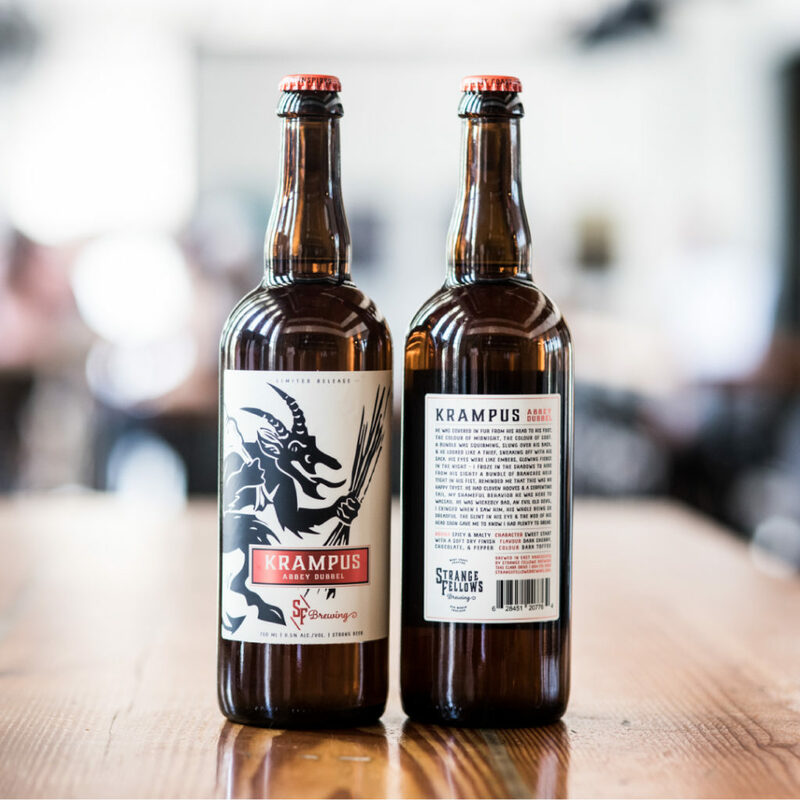 KL: With so many craft breweries opening up in BC, has BC’s craft beer hit its peak yet? IH: Yeah, it’s such a good question. People talk about this quite a bit. For us at Strange Fellows, we have a retail business in East Vancouver. I think we have reached the saturation point for brewery tasting rooms. But I think for breweries that make and distribute beers, there is still room for growth. 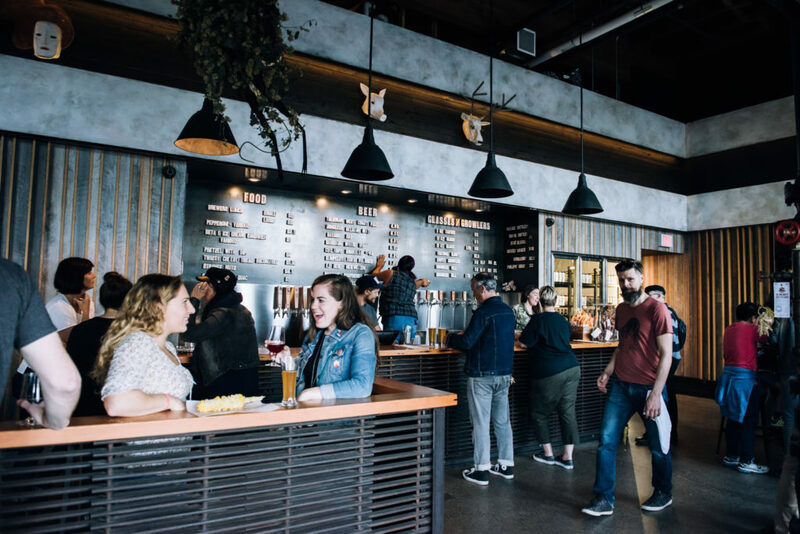 When you look at the majors versus craft breweries, there is still a massive opportunity for people who are moving over from the majors to craft beer. People are switching to better beer. Young people 20-30 years ago consumed what their fathers drank. As young people come of age now, they are immediately going into the craft beer scene. This is why there is such a shift in market share to craft brewers. The piece that the majors hold is still such a giant piece, but it is shrinking, and that shows that there is still so much opportunity for craft beer. I think there is still plenty of room for more players. But at the same time, it is tough when people walk into a retail outlet to buy packaged beer and the choice becomes difficult. That is hard for all of us in the industry to stand out. KL: What do you love most about craft beer? IH: I love to drink a delicious beer, that’s foremost. It’s also important for me to enjoy a great beer that suits my palate at the moment. But it’s also a beer I know is made with integrity and intention. I’m a contradiction. You’ll learn that about me. You can give me a beer from a major and I can enjoy that too. But the piece I don’t like is the typical big production setting where they are brewing with ingredients that are not the highest quality. Craft beer is very inclusive. I feel like a part of something that is historical and interesting. KL: How do you define integrity and intention? IH: I define integrity as having values that you aren’t afraid to have people know. It’s about two pieces that are correct with respect to each other. It’s what you say you do and what you are doing. If I’m making a north German Pilsner, we age it for a long time, minimum eight weeks post-fermentation. There is integrity in that. We are using traditional processes that make it as good as it is. Although again I’m a contradiction because I also ask, how can we make a really cool lager really fast? For us though, this is still about integrity because we aren’t looking to cut corners, but we are searching to see if we can discover a new technique or a process that might improve on the historical learnings. There is a whole world of discovery. Integrity is using good quality ingredients that you believe are the best for what you are trying to do. Integrity is also valuing the people you work with. It is having a good work environment where people feel satisfied with what they are doing. Intention is about producing something you intended to produce, the way you intended to produce it, from a quality perspective. KL: What is your favourite beer style? IH: This one is easy for me. Lambic and Oud Bruin. Soft and sour, quintessential and traditional Belgian Sour Beers. They are balanced, refreshing and complex. They are not too sour, but very drinkable. 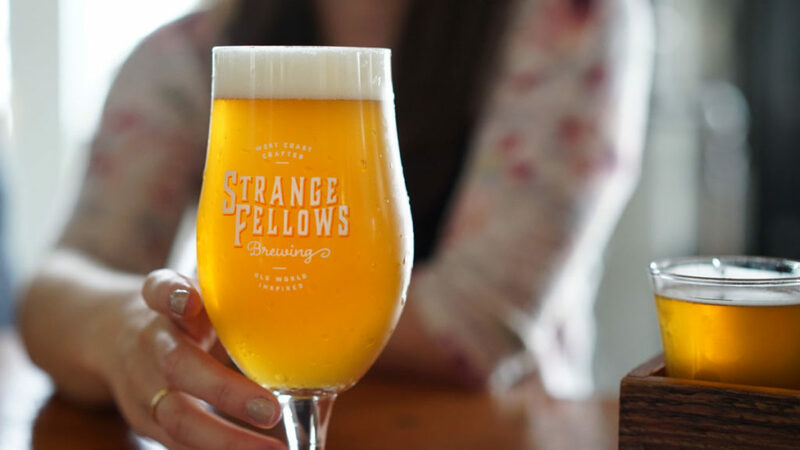 KL: If you had to sum up the beer style at Strange Fellows, how would you describe your beer philosophy? IH: Complexity and balance with character. We like to brew multi-dimensional beers, balanced beers, with lots of character. Balanced does not mean boring. They have complexity with lots of flavour elements, but they are balanced. KL: What are some of your favourite craft beers going into fall? IH: I like so many. I like traditional, lower strength stouts. Irish Stouts that are less than 4% ABV. I look forward to these going into the fall. Our Blackmail Milk Stout. It is a balanced milk stout; it is not too sweet. I look forward to drinking styles like Oud Bruin and other Belgian beers, and more hoppy beer. I drink IPA all year round, but I drink more through the fall and winter. I prefer more robust beers in general. KL: If you aren’t drinking craft beer, what are you drinking? IH: Black tea. I love black tea. As you saw in my email signature, I’m a “Particularist”. So I’m kind of fussy. Hopefully not annoyingly so. We also drink a fair bit of wine at home. I enjoy a good Bordeaux. Overall my favourite is a rustic-style, old-world Chianti paired with pizza. I also really enjoy the local whites from BC. There are a lot of great local white wines made here in BC. Kettle Valley Pinot Gris and several whites from Joie come to mind that are really great. I also enjoy a bit of whiskey during the winter. I’m a bit of a cider aficionado, I enjoy making my own cider, and I really like cider made with real cider apples. Cider is an amazing fall drink, and there are so many in the province making great real apple cider. KL: What do you love about the craft beer scene where you live? IH: It’s rich and there is so much to discover. It’s an exciting craft beer scene here. The options and varieties are plentiful. KL: What else do you love about where you live, outside of the craft beer experience? IH: Growing up on Vancouver Island, I love the ocean. I love the smell of the ocean. So I always recommend people go experience the ocean. I recommend people check out Stanley Park and False Creek and that they go sailing on the ocean. KL: If you had out-of-town company visiting your area for the first time, what hidden gems would you recommend for them? IH: We just had company in from Japan. We rented bikes from the bike pool and we went on a brewery crawl and checked out the various tasting rooms. We went to Brassneck. Then we came to Strange Fellows, Luppolo and then Parallel 49. There are some pretty awesome things to drink. It was a really fun brewery crawl. Something I love is that you never stop learning. The longer you do it, the more you realize there are things you don’t know. Where else in the world can you go on a bike and brewery crawl? There are others like Portland and San Diego, Fort Collins, Colorado and Chicago. What an incredible tourist experience. It’s not contrived. It’s totally real and awesome and you can see where the beer is made and then drink the beer. It’s easy to do as a tourist. You just need a phone and you can plan your trip on the ale trail. KL: Strange Fellows offers a monthly Strange Day, inspired by obscure superstitions and folklore from around the world. Tell me about your favourite Strange Day to-date. IH: Krampusnacht. The tradition says Krampus, the anti-father Christmas, is a scary beast that whips and kidnaps the bad children and puts them in a sack. So what we do is open up the taproom and invite kids to come in and get their photos taken with Krampus. Also, Koutzoulan or The Most Terrible Wolf Day, is coming up in November. That’s a good one too, as people must not wash or comb their hair, wear clean clothes, or leave the house after dark for fear of being eaten by the Wolf. We tie our events and storytelling into these real things in folklore and history. KL: Tell me about something new you are brewing right now. IH: We are brewing lots of different things right now. We have 6,000 litres of beer ageing in an oak tank right now. It has been there over a year now. It is sour but soft and complex. This foudre beer is not yet named. We have lots of different barrel beers on the go right now. We have a Russian Imperial Stout ageing in bourbon barrels right now. We will also be releasing Nocturnum, our Dark IPA for the months of November through March. This fall it will also be available in cans. Our White IPA Guardian, which is available for the other seven months is coming to an end soon for this season. KL: Tell me more about your Fellowship program and your upcoming offering. IH: Our Fellowship program is something we do for beer aficionados. They get the opportunity to enjoy barrel-aged, vintage, and exclusive limited release beers that aren’t available to the public. We release four different Fellowship-only quarterly beers and our members get an allotment of these beers. We have special events for our Fellows. I talk about the beers and do barrel tastings. Fellows get discounts in the taproom. It’s interesting for those that join because they have access to really special and unique, aged, and unusual beers. It’s also fun for us at the brewery because it gives us an opportunity to push ourselves and innovate and try interesting things with barrel-aged beers. It’s a lot of work staying fresh, but it’s also interesting. There is lots of blending involved and lots of variables, so we don’t know which beers will be included in the Fellowship program until the blending is complete. We’ll be launching Fellowship III on Friday, November 2nd. More info is available on our website. KL: Anything else you wish that I had asked you? IH: Our biggest selling beer is Talisman West Coast Pale Ale. It’s a beer I often say I brewed for myself and one I always wanted to be successful with. It’s the beer I often drink after work since it is only 4% ABV and I still have to head home to my wife and three kids. 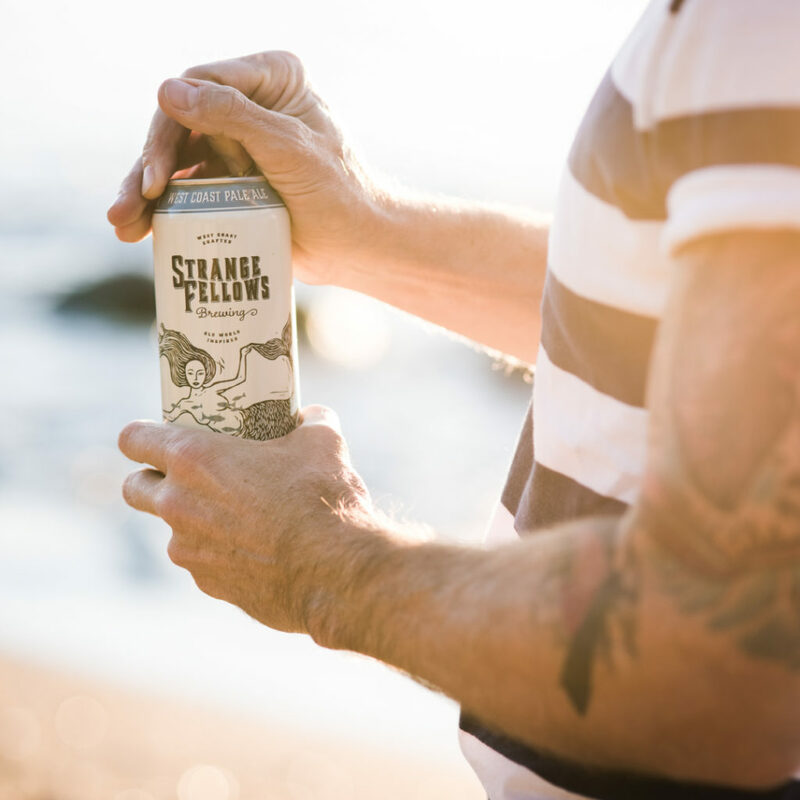 Despite its drinkability and very low ABV, it has a ton of character from a generous dry-hop of Mosaic and malt bill that includes British imported Maris Otter Pale malt. KL: Who else in the craft beer industry do you find interesting and why? IH: James Walton from Storm. We go back a long way. Conrad Gmoser from Brassneck. He’s a great brewer. Ryan at Luppolo; he built that place with his bare hands. He’s the head brewer, but he’s also a great builder. He really appreciates what has gone into the brewery. But next up I want you to interview Aaron MacInnis at Iron Road Brewing in Kamloops. I met him when he was at Main Street Brewing here in Vancouver. He is very innovative. Stay tuned for the next installment of the Hops Among Friends blog series, where I chat with Aaron from Iron Road Brewing on the newly launched Kamloops, Shuswap & Vernon BC Ale Trail. Until then, cheers!